We ran out of bread the other day, so I made a super quick pasta salad in the morning and everyone had something new in their lunches! I had overslept by ALOT (up working very late the night before!) and was pretty pleased with my quick thinking. I only had the opportunity to snap a photo of my husband's lunch. The girls had to race out the door with theirs. They were a teensy weensy bit late for school. pasta salad with frozen mixed veg, celery and chicken, grape tomatoes from the shop. When I made the pasta salad for the girls I had not put the celery or chicken in it. 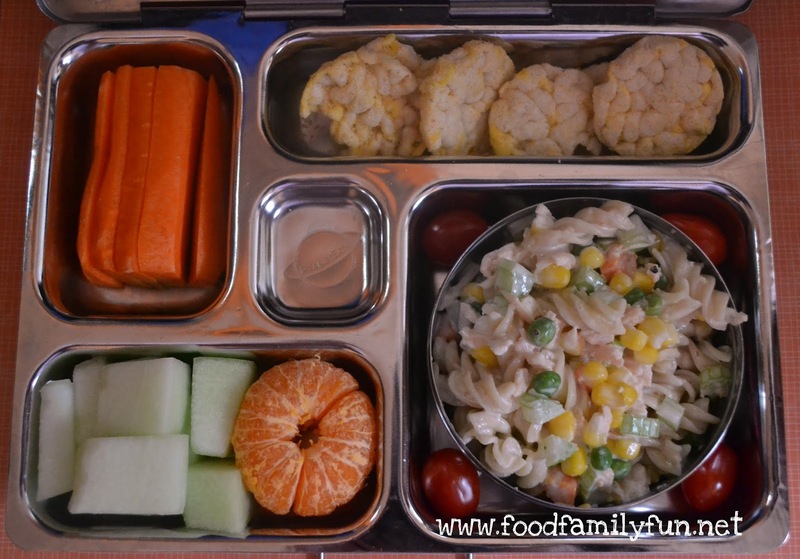 I added the extras for my husband only.The girls' lunches each had a boiled egg for protein. I also picked the peas out of Amy's so hers literally had pasta, corn and carrots, kind of boring but I was hoping that she would like it. Well the verdict is in -- nope, not really. She's a tough critic. Rose ate ALL of hers! We likely won't get many tomatoes out of our garden for a while - the weather was very windy and rainy for a while there and the plants just couldn't take it. Fortunately, tomatoes grow year round here so they can be planted again. The strawberries had a similar fate and this year's strawberry yield has been lower than usual too. So there isn't any homemade jam or syrup in the cards this year. I was really looking forward to trying a strawberry syrup recipe that I saw on Pinterest. I wouldn't buy strawberries to make those things as it would be so expensive. 1 quart of imported strawberries is $7.99 right now, and 1 quart of local strawberries is $9.99! That pasta salad looks so good! I love pasta salads. The possibilities are endless! Great looking lunch!